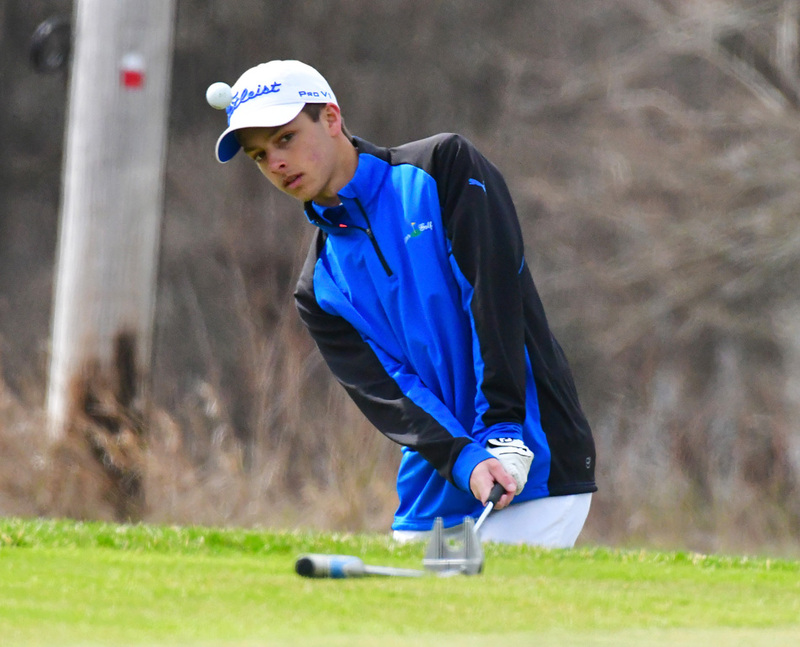 In a star-studded field at Rozella Ford Golf Course, Warsaw and Triton competed in the Don Dicken Classic. Warsaw was able to land a top-five score, placing fifth as a team with a 324 while Westfield had all five of its golfers under 80 to post a sparkling 305 to win the Classic title, a good eight strokes ahead of Penn’s Gold roster. Triton held a respectable post among the group on its former home course, shooting a 336 to place ninth. Warsaw’s Chase Byron putts on the ninth green during play at the Don Dicken Classic. “Playing today was just about hitting solid shots, that’s really the best way to combat the ball is by staying stable and staying within yourself,” said Warsaw head coach Rich Haddad. “The course was actually pretty dry given we got a lot of rain overnight into Thursday. Rozella drains pretty well with the creeks. For this time of year, the course is in great shape. Warsaw’s Cal Hoskins was the standout for the Tigers, shooting a fine round of 75 to tie for fifth overall. Chase Byron shook off some early rust to come in at 80, Jack Yeager shot 82 and Ben Bradner was Warsaw’s fourth score at 87. Triton had Beau Hepler lead the team with a 79, followed by Cole McKinney at 85 and both Chase Butler and Keegan Westafer carding 86s. Andrew Karr of Valparaiso was the event medalist with a 33-36-69 to card three-under for the day and Avon’s Tyler Nickol shot an even par 36-36-72 for runner-up. Dillon Drake’s 81 was the highlight for Wawasee in competing at the Northrop Invite at Colonial Oaks in Fort Wayne. Drake shot a 40-41 for the day and was the only sub-90 for the Warriors on a very windy track in Allen County. Caden Welty shot a 90, Evan Dippon had a 96 and Caleb Clevenger carded 101 to give the Warriors a 368 to tie Whitko for fifth in the tourney, Wawasee getting fifth on the fifth-man score. Fort Wayne Blackhawk Christian shot a 326 to win the Invite, followed by Manchester at 340 and Heritage at 362. A retooled lineup for NorthWood still had the Panthers fighting for top billing at Maplecrest Country Club Saturday morning. Lone returner Sean Hogan shot an 80 for the Panthers, which made its season debut along with new head coach Phil Ummel. Jon Cripe added an 87, then Noah Schwartz at 97 and Cooper Wiens at 98 comprised NorthWood’s 362 which put the team in fifth. Hogan was one of three golfers on the day to finish at 80, along with Concord’s Travis Hermon and Fairfield’s Connor Carpenter. The field of Elkhart area schools had Fairfield win the title with a 349 to beat out Northridge’s 354 and Goshen’s 357. Concord also shot 362 and took fourth on the fifth-man tiebreaker. Warsaw sent its JV to Rochester for the Rochester JV Invitational, with the Tigers placing third with a score of 390. Logansport won the title with a 355. Will Hall and Lewis Turley both shot 97 to tie for ninth on the individual leaderboard. Bryce Welk, Mason Whitaker and Jeremy Ryman all competed for the Tigers.